THE Wallabies have won their last 10 Tests against Wales but there is still cause for caution ahead of Sunday’s Rugby World Cup Pool A decider. In the last nine Tests played between the two nations, Australia has never won by a double-digit margin. In fact, Australia’s average margin of victory dating back to 2009 is less than a try — just 4.4 points. And who can forget the Wallabies’ two-point victory at Millennium Stadium in 2012 when Kurtley Beale dived over in the corner to score in the 80th minute? Nobody realised it at the time, but the result of that match shaped the 2015 Rugby World Cup. Why? When the world rankings were announced the following Monday, Australia, England and Wales were separated between three tiers. 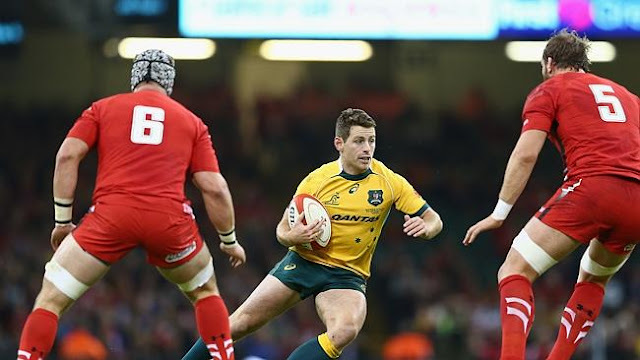 Six Nations champions Wales dropped down the rankings from seventh to ninth in tier three, England was ranked fifth in tier two, and the Wallabies sat third in tier one. Thus, Beale’s try resulted in the “group of death” — which claimed the life of England on Sunday. Upshot: Not for the first time, Wales let slip a healthy lead to hand the Wallabies yet another victory in their most recent meeting at Millennium Stadium last year. It was indeed a case of “Dai-ja vu” as The Telegraph cheekily reported. ‘“Dai-ja vu’ they call it and ‘Dai-ja vu’ it shall remain as Wales once again conceded a lead in the final 10 minutes to give Australia their 10th win in succession against the Dragons,” wrote James Corrigan. The Test was Sean McMahon’s Wallabies debut and, almost 12 months on, the 21-year-old flanker shapes as a key figure following the one-match suspension of Michael Hooper. Upshot: The Wallabies not only dominate recent history between the two sides, but at the World Cup their record is equally strong. While Wales won by a point in the first edition of the World Cup in 1987, the Wallabies have won the past four meetings at the tournament. Although it was not much more than a consolation prize, Robbie Deans’ men finished their 2011 World Cup in bright fashion, accounting for Wales 21-18 in the third v fourth playoff at Eden Park. Upshot: In less than a year, Michael Cheika has turned the Wallabies from a rabble into genuine Rugby World Cup contenders. That is in no way overstating the turnaround. The Wallabies were outstanding against England on Sunday, winning 33-13 at Twickenham to knock the host nation out of the World Cup. And, having also beaten the All Blacks in early August — with just one loss to their name this year — the Wallabies are beginning to look like the real deal. Upshot: Like the Wallabies, Wales’ finest performance of the past couple of years came against England at Twickenham. And, after accounting for Fiji by 10 points last week, Warren Gatland’s men will be confident of taking down another fancied nation at the World Cup. The win meant Wales have won their past five matches and nine of their past 10.